The Rustic Bathroom (half bath really) consists of 13 new meshes based off of this bathroom. 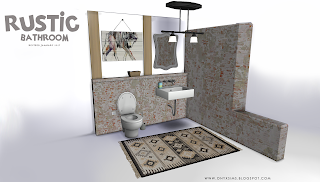 This is a revised version of my original Rustic Bathroom, the packages wont conflict with one another, but this version is better so I recommend that if you have the older version to just delete it. All the decor items aside from the rug and painting are linked, with the wooden wall plank being the master file. This just means they share the same textures to cut down on file size, and without the wooden wall plank package, the other decor items wont show up.